Retiring products isn’t something which often gets the attention it deserves. When a product comes to the end of it’s life, there is often an emotional sense of failure or sadness. This negative connotation results in the process and need to retire products in the portfolio becoming neglected and overlooked; a costly mistake for innovation. Actively looking for products that are on a downward trajectory or are no longer needed to deliver your current strategy is a healthy and rewarding endeavor, although not something you want to naturally attract if you’re in the product team in question. The processes itself of deciding whether to retire products or sometimes features raises interesting questions about the value being provided. These questions can surface value that exists in products, but is being under-utilised. When realised such products can sometimes become better supported to be more valuable and pulled into a growth or more profitable trajectory. Another point to consider if you’re managing a product portfolio is opportunity cost. Investing in products which have limited growth potential and are inevitably in decline is expensive. Although you might see a profit based model for such products, you could be investing the capital in new innovations. An enterprise has a finite capacity of resources, so you want to ensure you’re investing in future opportunities. The opportunity cost incurred by dragging out products that should be retired, is far from strategic to survive in today’s demanding global market. Putting some of that capital at the top of the innovation funnel, should be strategically encouraged. Before jumping in and retiring your product, there are a number of points to consider which should be researched to inform your decision. 1. Have you identified and are meeting the SLA’s considering third party commitments ? You might have decided to retire a product as it’s not providing the return you need, but your product might belong to an ecosystem with contractual SLA’s in place. Failing to observe and explore these SLA’s could result in legal repercussions which could far exceed the cost of keeping the product active and alive. Look to identify these first before making any decisions and consider the impact on your brand and other strategic opportunities against the impact of product retirement. 2. Do you have sufficient customer service in place to manage the additional customer support required to handle the retirement phase? When you decide to retire your product, you should expect to increase investment in customer services and support for a specific duration. Following a retirement announcement, existing customers will understandably have many concerns and this will likely spike the demand on customer services and support. Knowing this will help inform a comms plan with your marketing team to manage the messaging and support of retirement. You will also need to train and align the support teams. 3. Do you have sufficient technical capabilities to manage the strategic retirement phase ? Just as you need to invest in customer services, diligence should be undertaken on existing skills needed and available to manage the retirement of your product. On retiring a product, you may need to employ or source new skills specialised in some of the tasks needed at retirement. Consider for instance data management. You will likely need to manage the destruction of customer data securely and destroy or reconstitute hardware if it’s to be repurposed. 4. Have you identified dependencies and communicated to all business areas how this affects them and provided a co-ordinated plan ? This is particularly important for larger enterprises. Investigating the impact on dependent systems is an exercise well worth undertaking. In my own experience, it never ceases to surprise me how small systems sitting in the corner somewhere are unknowingly providing valuable contributions to the better known products elsewhere in the organisation. This exercise can not only increase the value of the system being marked for retirement, but reduces risk by calling out the impact required to manage any transitions or upgrades needed. 5. Do you have sufficient marketing, comms strategies and resources to support the retirement phase ? Resources will be required to systematically inform internal users, third parties and customers of a retirement decision. This will require strategic comms with managed timelines and review points and focused marketing to handle the retirement. This may also include up-selling an alternative product as well as offering users options to migrate their data to different systems. 6. Have you identified how assets and resources can be utilised and offered to other parts of the business or other products? Consider the retirement of products a learning opportunity. Before closing the doors on a product, consider what could be learnt and retained. You are likely to have very experienced staff which could add considerable value to elsewhere in the business. You might also have in depth knowledge of the product use data which other products could use, processes which could be shared and much more. Don’t overlook the potential value that can be shared for the benefit to the rest of the existing organisation. You should absolutely look to retain your human talent above all, which if not carefully managed will result in a potential brain drain. 7. Have you protected and provided options for customers to export their data ? It’s good practice and in some cases mandatory to consider developing solutions so that customers who use your product can move their data elsewhere or download it for future use. This will prevent a lot of customer angst and will also help you retain customers if moving them to other products. With so many products available, even products that are not being marked for retire allow for the easy transport of customer owned data for customers to own their data and integrate into other platforms. 8. As the product has been selected for retirement, has the pipeline of acquiring new customers been closed and strategically managed ? When a product is selected for retirement, it’s important to close the pipeline of new customer acquisitions. This may include the capability of signing up for the product or creating an account on a digital platform. You should extend this to discovering the product through various channels and informing sales and marketing so that no future sales will be negotiated. 9. Have all finances been identified and resolved ? In accordance to the previous questions, all retirement costs should be identified and proposed as part of the cost of retirement. It’s expected to execute the retirement of a product that additional finances will be required to manage the points above. In addition to this, any products costs and revenue should be resolved for financial forecasts. 10. Have alternative products been identified to transition customers ? Customers should be offered product alternatives where possible. Transition opportunities should be identified and migration expectations should inform the retirement strategy. Customer migration paths and processes to make this as painless as possible for customers is key to protect revenue not just for the product, but for the larger company brand. These simple 10 questions should help you investigate some of the high level activities that need to be initiated to support the retirement of any product. 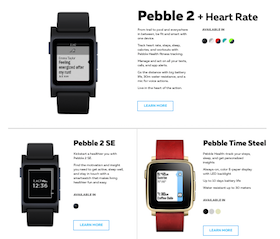 Pebble were fortunate to be in a position where they could afford to keep the messaging and support going for a while longer. 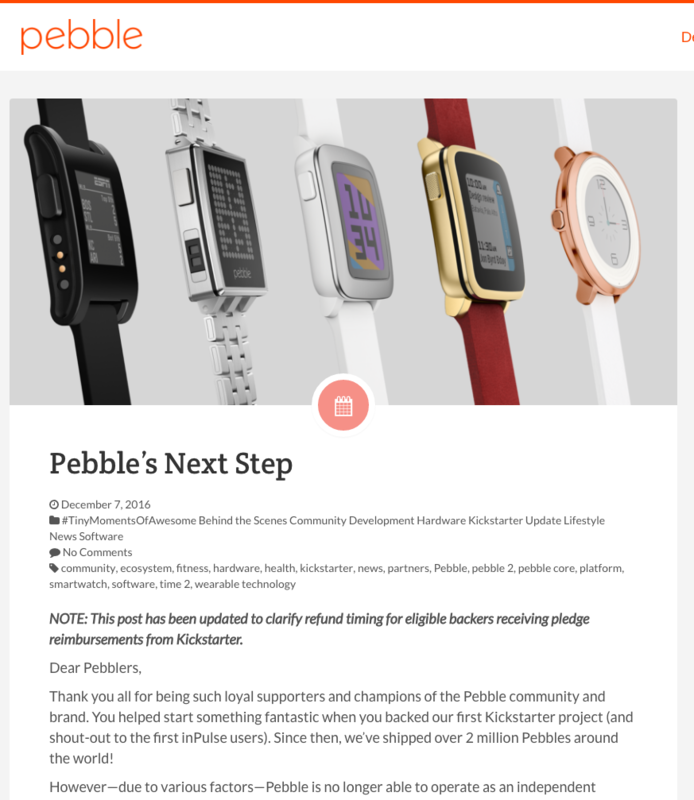 Delivering on these points, Pebble answered the key concerns and kept their social media channels active for sometime to manage the Pebble community. 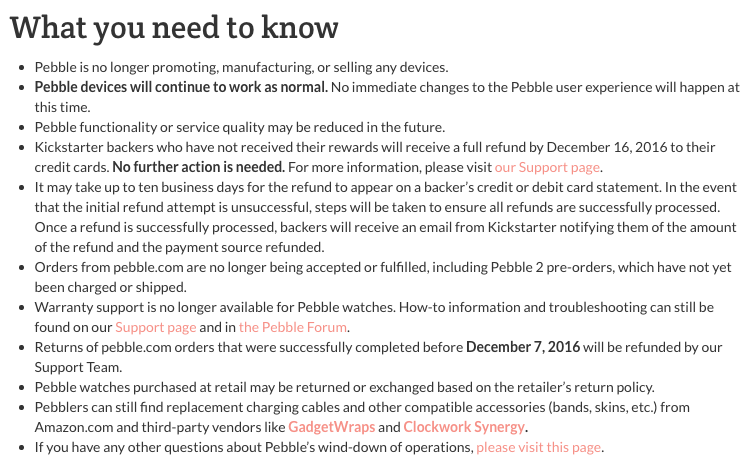 In addition to this, they invested in setting up a clear support page, have been very transparent on future support and have a clear plan to reimburse pre-orders. When it comes to retiring products, it’s not a simple decision. It takes a team effort to consider the points above and will require investment and management of the process to limit negative future impact on your business and strategically look for opportunity to learn. If you have any questions, experiences or feedback on retiring products, please add your comments below for the benefit of future readers.